LED Sky Tracer | A bungee sling shot with a difference! A bungee sling shot with a difference! As it flutters gently back down to earth! 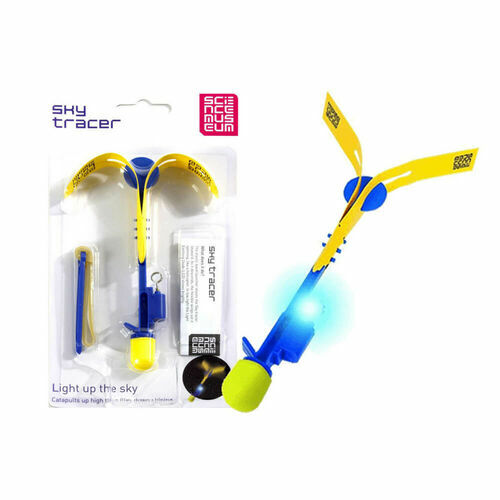 Your LED Sky Tracer is a sling shot with a difference! Pull the bungee back and watch it zoom into the sky! It's great for night time viewing as the fluorescent LED lights transform the dark into a blaze of spinning colours. The safety foam tip will protect it from crash landing, and keep little eyes safe as they watch on in awe! Just like a helicopter spinning in to land, enjoy the magical light show at your next evening barbecue! Dimensions: 15cm (l) x 2.5cm (w). Recommended for ages 9 and up (batteries included).